Graphics by fifty renowned artists from around the world are shown in the current exhibition project by "art place berlin" at the Park Inn Berlin-Alexanderplatz. The artists dedicated their works to the Spanish poet and dramatist Federico Garcia Lorca who was murdered in 1936 at the age of only 38. 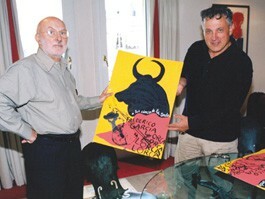 He became an icon of political, artistic-intellectual and religious freedom also widely beyond the borders of Spain. 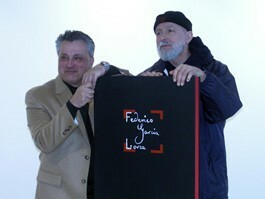 The idea for this graphic portfolio was born in winter 1977 in Madrid by the curator and art collector Toni Politeo. International artists should make artistic contributions in memory of Federico Garcia Lorca - poet and dramatist, musician and painter, freethinker and reformer, a friend of Salvador Dali and Luis Buñuel. Travelling round the world Toni Politeo won over artists from 22 countries - from China to Chile - to his idea. 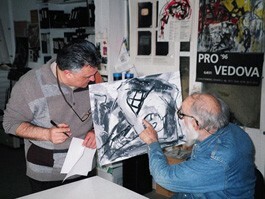 A lot of well-known personalities supported him - for example the art reviewer Pierre Restany who gave the "Nouveaux Réalistes " their name in 1960. 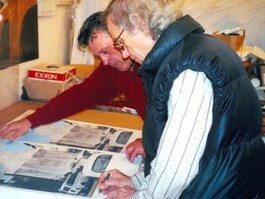 From this group ARMAN and CHRISTO are represented in the portfolio. In the summer of 2003 the project was completed. 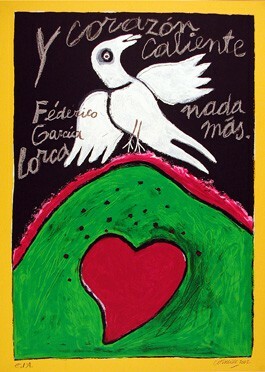 The Garcia Lorca portfolio which contains coloured litho- graphs and serigraphs originated in the 1990ies. It is a homage to a generalist who sowed instead of hatred, violence, intolerance and political regress love, truth and understanding and who united the folk art of his homeland with modernity. Politeo's compilation became also an informative tour through the contemporary international art and the list of the involved artists sounds like a "who is who" in modern art. It became a document of cultural, artistic and historic importance. With her works the artists set an sign for international understanding, for tolerance as well as for the freedom of the individual. The fact that some involved artists had first-hand experiences with a totalitarian state contributes to the authenticity of the portfolio. Posthumously it is a memorial to those artists involved who died during the first years of the 21st century - Arman, Miguel Berrocal, Jeanne-Claude, Corneille, Josep Guinovart, Ivan Lesiak, Bengt Lindström, Roberto Matta, Jean Messagier, Aldo Mondino, Edo Murtic, Jésus Raphael Soto and Emilio Vedova. Musicality, mysticism and metaphorical images are shaping Garcia Lorca's virtuoso language which found its congenial expression in the Politeo portfolio by the plurality and internationality of the artists involved. Garcia Lorca's linguistic richness corresponds with the litho- graphies' stylistic variety and power of colours: ranging from a figurative Naturalism used by Markus Lüpertz and Cornelia Schleime to an abstract or geometrical Expres- sionism used by Edo Murtic or Peter Stämpfli to a literally "memorial-writ" used by Paul Bogaret and an emblematic abstraction used by Jésus Raphael Soto. 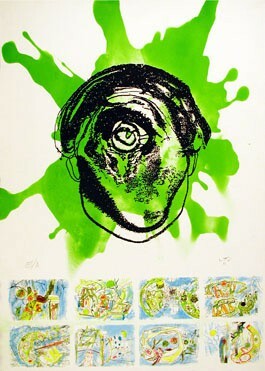 Roberto Matta who knew Garcia Lorca personally was inspired by Dali's surrealistic portrait of the poet made in 1924 in Madrid when he created "his" Garcia Lorca whose single eye is setting its sight visionarily on the viewer. The Garcia Lorca portfolio is an appeal to make sure that everything will "not be a terrible repetition" as the poet wrote in his last drama "La Casa de Bernarda Alba" ("The House of Bernarda Alba") - a repetition of a senseless death in a senseless world; Senseless because it is based on hatred, incomprehension and violence.